The challenge in any holiday season is to find fresh entertainment that carries a theme without resorting to conventional tropes or clichés. Two local companies have offered their own version of a holiday program not set necessarily in the season but with a spirit that fits perfectly into the celebration: Sackerson’s ongoing production of The Little Prince and Repertory Dance Theatre’s recently completed run of Top Bill. The Little Prince, Sackerson. Shawn Francis Saunders (The Fox), McKenzie Steele Foster (Little Prince). After the book was published, Saint-Exupéry returned to Europe as a wartime pilot but his plane disappeared on July 31, 1944. Nearly 60 years later, wreckage recovered off the Mediterranean coast confirmed that, indeed, it was his plane. In Sackerson’s newest production of The Little Prince, directed by Dave Mortensen and as a regional premiere of an adaptation written in 2000 by John Scoullar and Rick Cummins, the cast magnificently interprets the sense of being reunited with our inner child after a long, difficult and even frustrating pilgrimage. The Little Prince, Sackerson. Amy Ware (The Snake), McKenzie Steele Foster (Little Prince. Buoyed by the sensitive musicianship of Brooke Bolick on cello and Graham Brown’s on-point character choreography, the show awakens the charms, whimsies and pure pleasures of childhood. 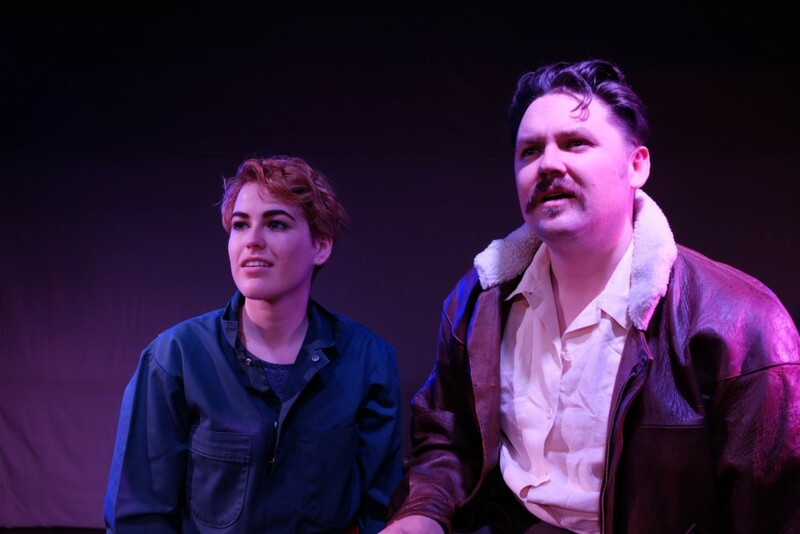 And, there are moments, especially late in the play, when The Little Prince (played with spot-on innocence by McKenzie Steele Foster) and The Aviator (in a most sincerely heartfelt rendering by Alex Ungerman) hit the right poignant tone. On the page, the adapted script is tight, terse and almost too controlled for doing artistic justice to Saint-Exupéry’s famous fable. But, Mortensen’s creative choices as director loosen up the contours in many effective ways. The narrator (The Aviator) and The Little Prince engage in the primary counterpoint, each learning the gift of instructive observation from each other. Ungerman intuitively shapes his role, as he evolves from being detached to being conflicted about empathy and detachment and, then, finally, realizing that even in the stars, the ties and connections we maintain still matter. As The Little Prince, Foster warms noticeably from seeing grownups as strange to the encounter with the Fox (played in outstanding fashion by Shawn Francis Saunders who also fills various cameo character roles). The Little Prince, Sackerson. McKenzie Steele Foster (Little Prince), Alex Ungerman (Aviator). Brown’s choreography of character is particularly good in the encounter between The Little Prince and The Fox and Saunders drives home the core message about human connection and caring about others in a solid interpretation. 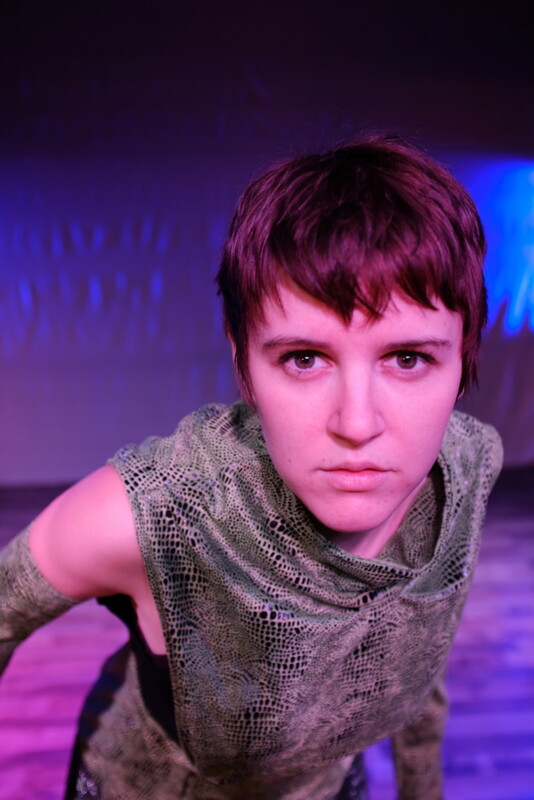 Amy Ware is equally excellent in her two roles as the Rose and the Snake. 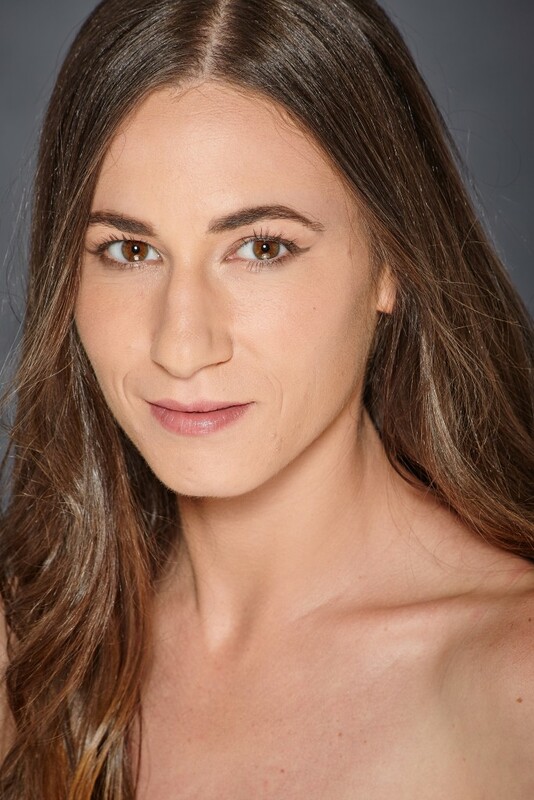 She portrays both characters with graceful ease, and renders Brown’s choreography for both roles in a convincing performance. Bolick’s music strikes the right subdued incidental tone, and makes good use of the cello’s diverse effects including pizzicato, sul ponticello, natural and artificial harmonics and other textures. The choreography and music add significant depth, although at one point the choreography may have been too densely packed for the small stage when all four actors were present in a transitional scene moment. The Little Prince, Sackerson. Amy Ware (Snake). The Aviator draws a ram but The Little Prince grumbles that the drawn animal appears too old, and that he wants “a sheep that will live a long time.” The Aviator responds by drawing a box, adding “the sheep you want is inside.” And, The Little Prince says, “That is exactly the way I wanted it!” Foster and Ungerman establish the desired stage chemistry from this point which coalesces the ensemble’s performance throughout the well-paced show, running approximately 70 minutes. In the many articles, books and scholarly journal submissions written about Saint-Exupéry and the circumstances about his life and the writing of The Little Prince, we learn not only how art imitated life but how, in the author’s experiences surrounding his love of aviation and his contentious marriage, life imitated art. The strange sense of foreshadowing and the inspired integrity of Saint-Exupéry’s lived experiences are carried through in the performances of Sackerson’s production. The production caps a distinguished year for Sackerson, one of Salt Lake City’s newest theatrical companies. The company consistently delivers some of the most captivating performances on any stage in the metropolitan area. 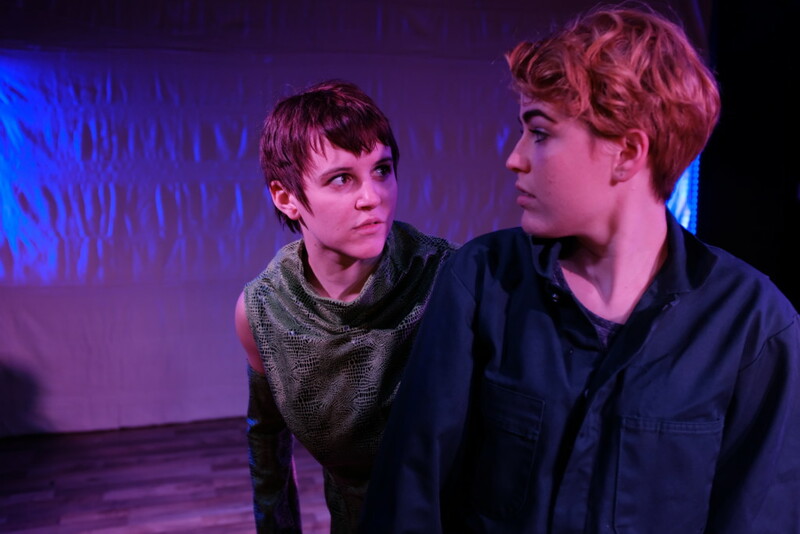 Performances will continue on Fridays and Saturdays at 7:30 p.m. every weekend up until Christmas at the Art Factory, the multidisciplinary art space managed by the Utah Arts Alliance. There are three matinee performances: Saturday, Dec. 9, at 2 p.m.; Sunday, Dec. 10, at 3 p.m., and Saturday, Dec. 23, at 3 p.m. Ticket information is accessible at the Sackerson website. Suite Benny, Bill Evans, Repertory Dance Theatre. Photo: Sharon Kain. After its monumental, emotionally incisive Sanctuary concert in October, Repertory Dance Theatre took a different path in the weekend before Thanksgiving by celebrating the homecoming of William ‘Bill’ Evans, one of the dancers in RDT’s first generation of performers in the late 1960s and early- to mid-1970s. The concert struck the right tone for the holiday season with six works that truly thrilled audiences in their accessibility. But, the performances in the Top Bill concert also matched the exceptional standards of its previous concert, infusing technical precision and excellence with the heartening vibe of deep admiration for a beloved, internationally-known choreographer who always looks forward to revisiting his Utah roots. The joyful mood was set immediately with the opening work For Betty, the earliest of Evans’ selections for the concert, which he choreographed in 1970 at the age of 29. Using all three movements of an Antonio Vivaldi string concerto, Evans precisely replicates the angular, muscular rhythms and passages of the Baroque piece with six dancers propelling themselves through the performing space in leaps, jumps and arcs. The work was set as a tribute to Betty Hayes, who taught for nearly a half century in The University of Utah’s modern dance program. Like Vivaldi’s music, Evans’ For Betty is a straightforward work of technical bravura – the meat and potatoes of the performing arts form executed perfectly for the audience’s satisfaction. The dancers gave it a worthy slam dunk performance. 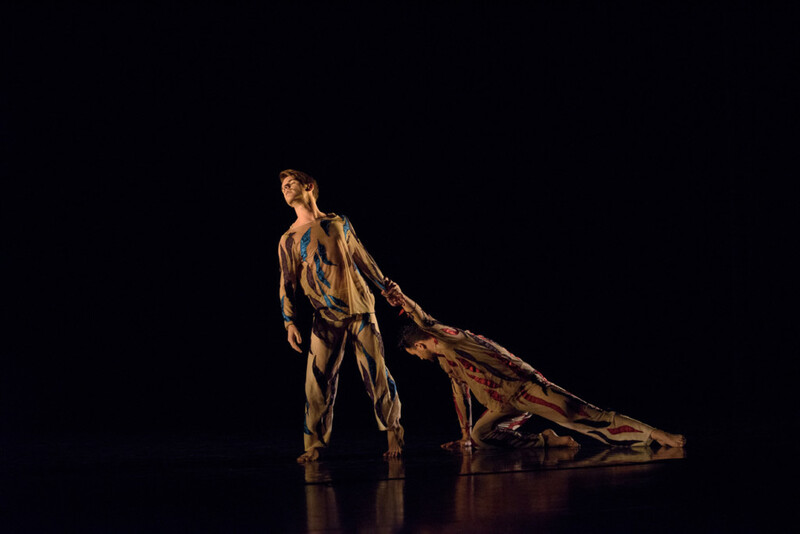 Alternating Current, Bill Evans, Repertory Dance Theatre, Tyler Orcutt, Dan Higgins. Photo Credit: Sharon Kain. Likewise, dancers Dan Higgins and Tyler Orcutt executed with electrifying precision Alternating Current, a 1982 work Evans cast as a duet and which he frequently performed with Gregg Lizenberry, a former partner who also was among the earliest RDT performers. 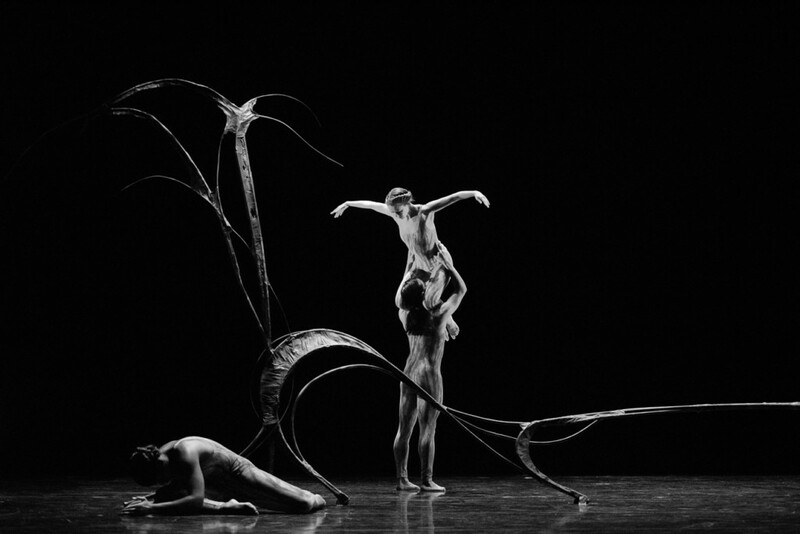 Focused on convincing movement expressions that represent the alternating stable and volatile cycles of electric current, the dancers realize an abstract study of relationships in the characters of a flame and a moth. The music scored by David Sannella and Simon Jeffes sets the appropriate soundscape of droning and humming; interspersed with incidental moments of fluid serenity more often interrupted by tightly wound, tense sounds. It is a complex but realistic statement on the conflicting, simultaneous feelings of attraction and repulsion and both Higgins and Orcutt captured the effect to its full extent. While Alternating Current represented a new addition to the RDT library, Tin-Tal was given its first reconstruction by the company since 1974, when it was last performed and which then featured Linda Smith, the company’s co-founder and current artistic director, in the solo role. This time, Ursula Perry performed the solo, accompanied by four other dancers, in a demanding display of technical precision that encompasses patterns of movements often realized as triangles, lines and circular arcs along with highly disciplined footwork and stylized gestures and facial expressions, which really communicate most of the emotional dynamics of the classical Indian dance form upon which the piece is based. Inspired by the classical dance tradition of southern India (Bharatanatyam) and the tabla music of Pandit Mahapurush Misra, the most deeply revered musician of this genre, Evans brings his uniquely holistic movement language to bear in the work. The dancers were a marvel of discipline to observe, as they seemed to balance effortlessly the distribution of their body weight and the firm positioning of their limbs. So much of Evans’ work conveys a naturally fluid aspect, and it was compelling to watch the dancers use their hands to cut into the lines of movement and let it flow around their bodies. It was pure celebration in multilingual terms. 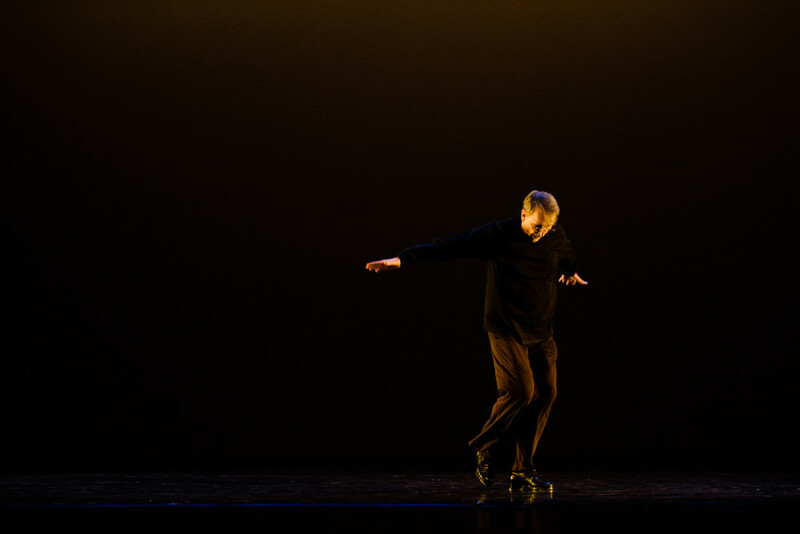 While the dancers rested and prepared for two outstanding examples of theater-inspired work later in the program, Evans gave evidence of his tap dance skills in Three Preludes, a 2009 work he dedicated to his mother, Lila Snape Evans. At 77, Evans seems eternally youthful and is a strong example of how dancing can keep one young, as evidenced in major studies published earlier this year in the Frontiers in Neuroscience journal. Evans would be a model case study for any neuroscientist looking to build upon this specific strand of research. Three Preludes is Evans’ master class in body intelligence. But, most enchanting about his performance was how he imbued the music of Gershwin’s Three Preludes, which the composer first performed in 1926 at a New York City hotel. Evans instinctively recreated the virtuosic effects of Gershwin’s music – the Brazilian-influenced syncopated rhythms of the first prelude, the smooth bluesy lullaby of the second and the classic Q&A rendition of the third, alternating between melodic and rhythmic lines that conclude with Gershwin’s jazzy flourish. Three Preludes, Bill Evans, Repertory Dance Theatre. Photo Credit: Sharon Kain. 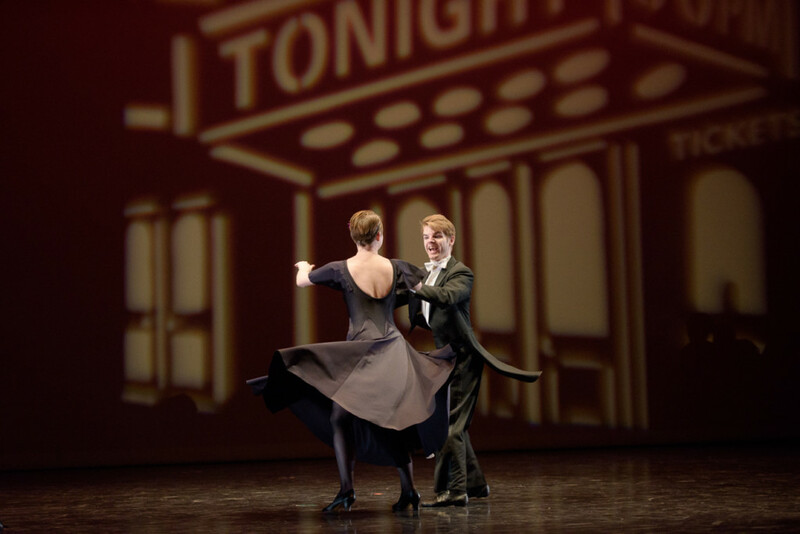 Evans’ lifelong love of jazz is matched by his deep appreciation of classic Hollywood musicals and ballroom dance, elegantly recreated in Suite Benny, which featured the entire company. Evans choreographed the work for RDT 30 years ago but decided to reset it in significant ways for the new performance. 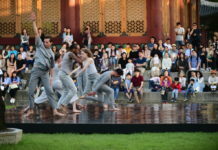 Here, the tight connection which the current company of dancers has established over the last five years paid a major artistic return on investment. It was an infectiously fun and impressively executed piece of ensemble work, as the dancers reflected the right mood of the music featuring songs by Edgar Sampson and Louis Prima, in classic recordings by Benny Goodman and his orchestra. Sassy, smart and intimate in harmony and style, it was a rapturous nostalgic tribute to one of America’s great dance traditions. And, the solos by Ursula Perry and Lauren Curley capped the piece in the right style and mood. Suite Benny, Bill Evans, Repertory Dance Theatre. Photo Credit: Sharon Kain. The full company returned to perform Crippled Up Blues, a piece Evans created in 2015 to help celebrate RDT’s golden anniversary. A native Utahn, Evans sets the work as the dance version of a historical album celebrating the land of Deseret, accompanied by a suite of songs composed and performed by the locally based 3hattrio. 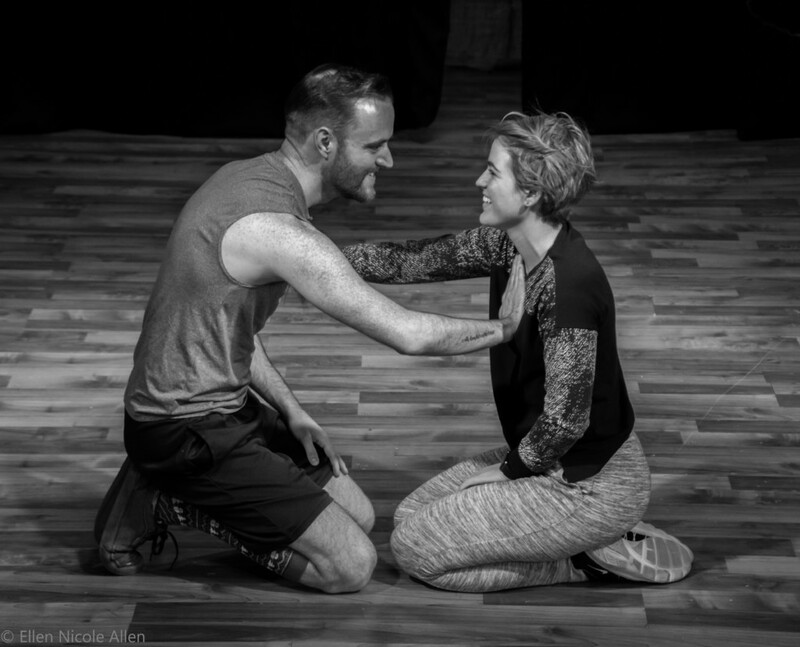 The work puts tremendous demands on the performers, who not only must execute the athletic and acrobatic aspects of the movement which Evans has choreographed but also must convey the story-telling core of the work. Meanwhile, the songs anchor the unique imagery of the place we call Utah and Deseret. There’s an exuberant celebration of the land, as marked in the melody of the wind sweeping the high desert, for example. And, then some of the scenes are darker, as the dancers act out songs about the consequences of love and murder or laments about encroaching commercial development and worries about losing cherished legacies. The dancers rise to the challenge in every moment – the best example of it occurring at the end of the piece, an inspired reflection of deep love for Deseret. The holiday homecoming certainly touched the audience, which rewarded the company’s efforts with a well justified standing ovation. Little time is being wasted though, as the company prepares for its next concert, Emerge, on January 5 and 6, 2018, featuring new choreography by the company’s dancers.